The surface type defines which particle and sound effect which will be shown on collision. 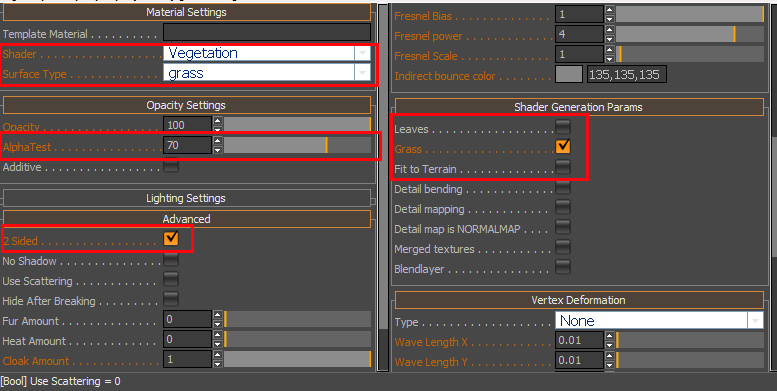 Blend With Terrain Amount Sets balance between terrain and vegetation color. Detail Bending frequency 複雑な（風）曲げの曲げ速度の定義 Always make sure That this is in the right proportion to the wind in your level. Detail bending phase Sets detail bending phase. Detail tiling U Sets detail diffuse_bump tilling. Detail tiling V Sets detail diffuse_bump tilling. Detail bump scale Sets detail bump scale. 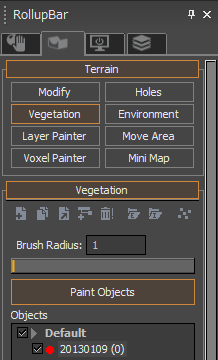 Detail blend amount Sets detail blend scale. This is for bigger grass patches only. Fits the object to the terrain surface.